Gold was again weaker against the Dollar as it tumbled on the back of an impressive economic performance from the US economy as the latest Durable goods and GDP figures gave a huge boost to the Dollar Index that surged towards the 95 level again. Despite Powell’s claim that the removal of the "accommodation" sentence did not mean anything, US Treasury yields were lower on the FOMC but still above the 3% psychological level that should keep the dollar bid whereas Gold yields nothing for investors. Gold tumbled during yesterday's NA session breaking the bottom of its range and reaching the $1180.6 support level. 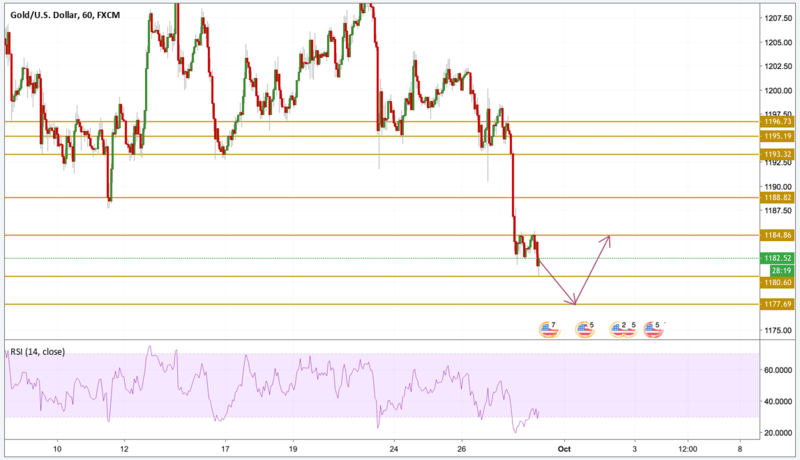 Gold entered in a deep state of oversold condition as we can see on the RSI, and the price seems to form a consolidation in this area. That means that another downward move is most probable to happen followed by a small correction to ease these extreme conditions. The next level to watch is the $1177.7 support level.